Richard uses this tool to achieve the perfect shape and to clean up that difficult end grain on bowls. 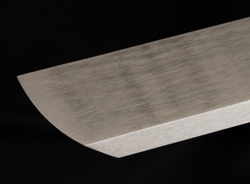 The edge has a gentle curve to it for making shear cuts as well as shaping cuts. The scraper measures 7" by 3/8" thick and has an 11-1/2" handle.